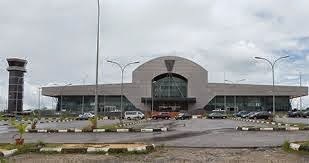 The Nigerian Government has downgraded the Asaba Airport over the failure of Delta State Government to put in place safety and security measures at the airport, an Assistant Director, Press & Public Affairs, Ministry of Aviation, James Odaudu,​said Tuesday in Abuja. Mr. Odaudu said with the downgrading, the airport would now be allowed to accommodate the operation of only Dash 8-Q 400 aircraft or its equivalent until all the safety issues were addressed. He stated that the Nigeria Civil Aviation Authority has raised several safety concerns. The safety concerns according to the statement, were over undulations on the airport’s runway, the lack of the required strip, perimeter fencing, drainage, as well as lack of adequately trained technical personnel. Mr. Odaudu said the decision was taken since no concrete steps had been taken to address the issues which were capable of compromising the safety of flight operation and the passengers. “It has therefore become a matter of serious concern that despite a series of meetings with, and assurances given by the operators of the airport. “The Federal Government has also drawn the attention of the owners of the airport to the fact that it has, through its inability to address the issues, violated compliance with safety standards. “Safety standard as stipulated in the Nig. CARs Part 12.6.2 and 12.6.3 in respect of the airport runway and its associated facilities as well as adequately trained personnel were violated,” Mr. Odaudu said in the statement. He quoted the Minister of Aviation, Osita Chidoka, as saying that the downgrading was done in public interest. “Because the Federal Government places very high premium on the safety and security of aviation passengers and would never compromise set standards for whatever reason. “The minister, however, assures that the airport would revert to its previous status as soon as all the safety concerns are adequately and satisfactorily addressed,” Mr. Odaudu said in the statement.